Obama shakes hands with Castro during a memorial service for former South African President Nelson Mandela in Soweto, South Africa, on Dec. 10, 2013. Former Cuban leader Fidel Castro says his brother introduced himself to Obama in English, telling him, "Mr. President, I'm Castro," as the two leaders shook hands. 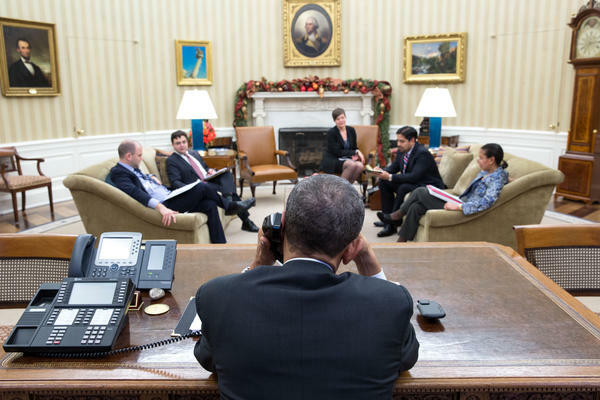 President Obama speaks with President Raul Castro of Cuba from the Oval Office on Tuesday. A day later, both men announced plans to normalize relations between the Cold War-era foes. On April 22, 2000, government officials seized Elian Gonzalez, who is seen being held in a closet by Donato Dalrymple (right), one of the two men who rescued the Cuban boy from the ocean after his mother died trying to come to the U.S. Elian's U.S.-based relatives fought to keep him here, but the U.S. finally returned him to Cuba, where his father lived. Refugees aboard a vessel in the small port of Mariel, Cuba, on April 23, 1980, wait to sail to the U.S. Fidel Castro agreed to let them leave the island for Florida in what became known as the Mariel boatlift. 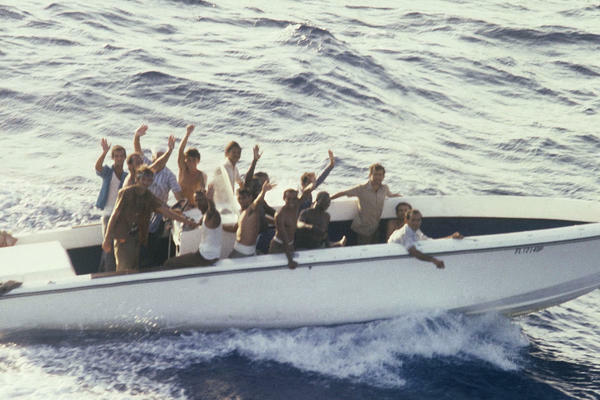 More than 100,000 Cubans made it to the U.S. The new arrivals included many thousands released from Cuba's prisons and mental institutions, leading to a tightening of the U.S. embargo. 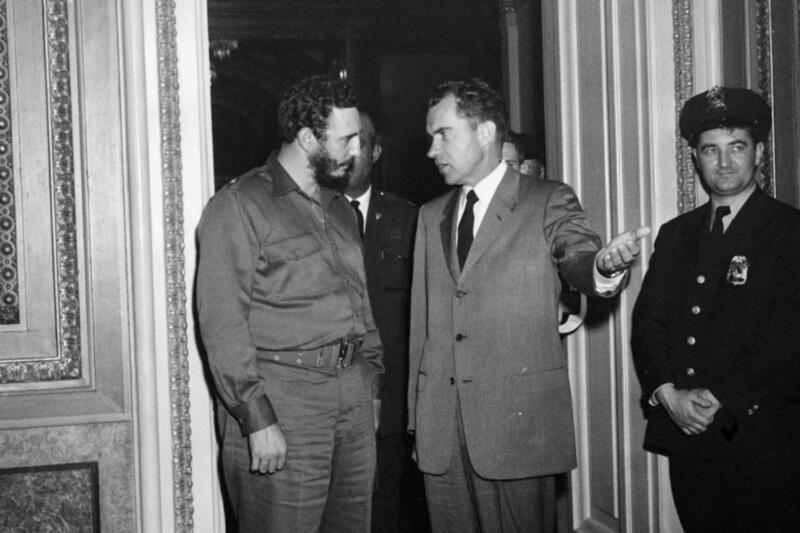 Fidel Castro and Vice President Richard Nixon after a nearly 2 1/2-hour meeting in Washington on April 19, 1959. Castro described the meeting, scheduled for 15 minutes, as "very friendly." Less than two years later, the U.S. severed ties with Cuba. President Obama said Wednesday the U.S. and Cuba will normalize relations, which have been strained since being severed in 1961. He spoke to Cuban President Raul Castro on Tuesday to finalize details of the announcement. Tuesday's talk wasn't the first conversation between the two men. They spoke publicly last December at a memorial service for former South African President Nelson Mandela. Castro's brother Fidel, the former Cuban president, said the current Cuban leader introduced himself to Obama in English, telling him, "Mr. President, I'm Castro." The two leaders then shook hands — reportedly only the second time leaders of the two countries had shaken hands over the past half-century. As NPR's Greg Myre noted, the handshake caused a "diplomatic stir." One of the biggest stories in U.S.-Cuba relations prior to that handshake was Elian Gonzalez. The then-6-year-old Cuban boy was rescued off the coast of Florida where his mother and others had died trying to reach the U.S. His U.S.-based relatives tried to keep him in the country, but his father in Cuba wanted him back. The legal battle went to the U.S. Supreme Court, which rejected an appeal from Elian's Miami relatives. Government officials seized the boy on April 22, 2000, and he was returned to Cuba, where he still lives. On April 20, 1980, Fidel Castro declared the port of Mariel open, allowing any Cuban who wished to leave to go to the U.S. More than 100,000 did. But some of them were spies; others were newly released from Cuba's prisons and mental institutions. The Mariel boatlift, as it came to be known, led the U.S. to tighten its restrictions on Cuba. Fidel Castro and his communist rebels, who included his brother Raul, ousted Cuban dictator Fulgencio Batista in 1959. For nearly two years after that, the U.S. and Cuba maintained relations. 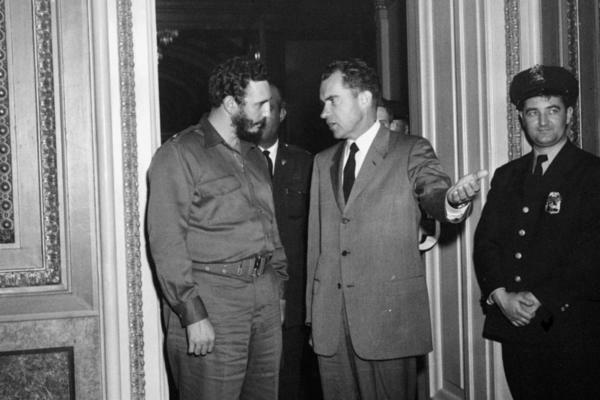 Fidel Castro visited the U.S. — and even met with then-Vice President Richard Nixon. For more than 50 years, the prospect of another Castro visit to Washington seemed unthinkable. 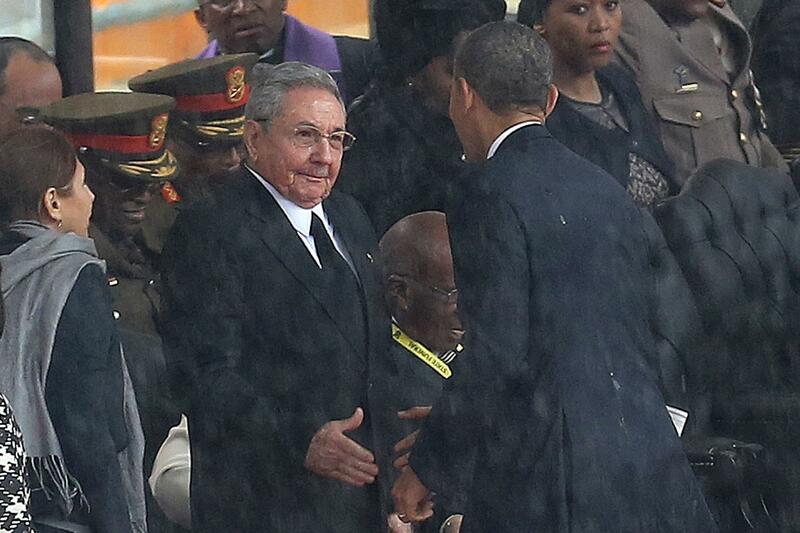 Today, White House spokesman Josh Earnest said he "wouldn't rule out a visit from President [Raul] Castro."